The oldest child in your family will require careful handling and a very different approach to the way you treat their siblings-particularly if there is a large age gap. In some ways, parents with children who are considerably older than each other may find it easier than if their children are 18 months or so apart. Children who are close in age may well share the same interests, the same friendship groups and even be in the same class or year group at school. This can lead to a lot of resentment from the older child who may well feel that their younger sibling is ‘cramping their style’ by hanging around them at school and wanting to spend far too much time with them. It is important that children choose their own friends-even though there may well be times when you really don’t approve of their choices! Imagine how frustrated you would have been if your younger brother or sister decided to hijack your friends and start hanging out with you. Try to understand that your oldest child will expect to be treated differently, and rightly so. After all they are growing up fast and part of that growing up involves becoming independent-both of their parents and their younger brothers and sisters. It is really important to keep communicating with your child-even if they are rapidly turning into a moody, sullen teenager! Younger members of the family have to try and understand that their big brother or sister is allowed to do different things to them, and that it is fine for them to stay out late and so on. 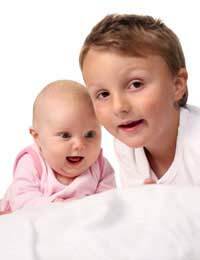 Older children have different worries and concerns to their younger siblings, and may want to spend a lot of their time either on their own or with their friends. You may find that they go out of their way to avoid spending time at home and unfortunately this is just one aspect of growing up that we have to accept. On this website you will find a feature that offers help and advice about parenting children once they reach secondary school age, and their school day will continue to be an important part of their week. However, the teenage years are just one period of your child’s life when changes take place. Within a family, if you have a preschool child and a primary school child, you will still find that you have to treat the older child differently. You may also find that your older primary school child really starts to rebel if you continue to treat them the same as their younger brother or sister. I Am Not A Baby Any More! This is something that all parents will hear at one time or another, and is a perfectly valid response to parenting that is a bit inconsistent or in your child’s eyes unfair. It is hard to accept that our children are growing up and becoming more independent, and it is a difficult and confusing process for them to handle. Try to accept that they are growing up and need their space to develop new interests, make new friends and discover their own personality. With your help and support this will happen without the rest of your children feeling pushed out.